This is second post on jQuery Dialogify plugin with PHP. And in this post we will discuss how to use jQuery Dialogify Plugin for insert or add data into Mysql table using PHP with Ajax. In previous post we have seen how to load dynamic mysql data into pop up dialog box using jQuery Dialogify plugin with PHP Ajax. Inserting of Data is a basic function of any application. If you want to make single page CRUD application then you have to perform all CRUD option on same page without going to another page. For do all operation on Single page you have to make form for insert data in pop up modal dialog box. For make pop up dialog box, In one of our tutorial in which we have use Bootstrap modal for use Insert data with PHP Ajax. By using Bootstrap modal we can make pop up modal dialog box. But now we want to use jQuery Dialogify plugin for make pop up dialog box, and in this modal dialog box we want to make insert data form. Here we will not only insert data into mysql table but also we will also upload image also with data insertion. So, here we have use jquery Dialogify plugin for insert data with upload file also using PHP with Ajax. So, with jQuery Dialogify plugin we cannot make form under pop up dialog box directly. If we have use jQuery Dialogify Plugin for insert data then for insert data we have to make form for submit data to server. But in this plugin we cannot directly make form in pop up dialog box, but for make form, we have to define form fields in some other php file. In that file we have to just define form field, this plugin will automatically add form tag. Now the question arise how other php file form will be append into jQuery Dialogify pop up modal. For this we have to write new Dialogify() method, and under this method we have to define php file in which we have define form field. This method will pop up modal dialog box with form fields, which has been define php file. Below you can find complete source code of how to use jQuery Dialogify plugin for insert or add data into mysql using PHP with Ajax. 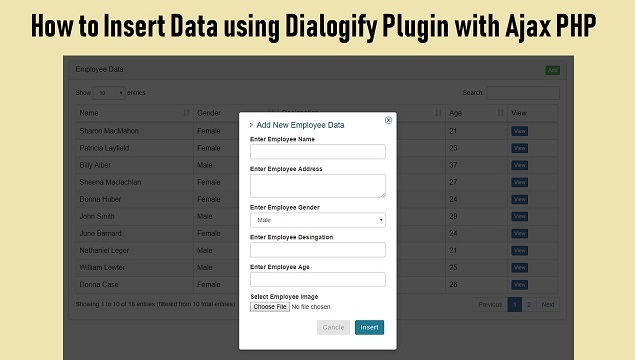 This is combine source code of View Dyanmic Data using Dialogify plugin post and Insert Data using Dialogify with PHP Ajax. If you have any query regarding this post, you can send your query via comment.